We’re keeping the good times rolling with another exclusive giveaway inspired by our guide to the Best Cooling Mattresses on the market. We’ve already got contests for Purple, Ghostbed, Loom & Leaf, and WinkBeds in the works, but are ready to add a new one from Brooklyn Bedding to the mix! The Brooklyn Bedding Aurora mattress is a hybrid bed that mixes gentle foam top layers with a supportive pocketed coil base for a truly all-encompassing sleep. What sets this baby apart is its phase change material cover, which makes the bed literally cool to the touch. Black Friday & Cyber Monday Mattress Sale 2018! I think the Zenhaven would suitt me best, but my mattress is so old any of these would be a vast improvement. I really like the Zenhaven and the GhostBed Luxe! The Brooklyn Bed bed is my favorite bed. Very informative on all the mattresses. Any of your great mattresses will be a tremendous improvement on our tired, old, saggy wreck of a mattress. The Brooklyn Aurora would be my 1st choice for sure! Love it! Im in need of a new mattress! Mine is ancient and is as good as sleeping on hardwood floor haha. Thanks for the chance! The Casper mattress is the one I am so far interested in. I would like to try Leesa. The bedding mattress that I have been looking for is for my son, who would greatly appreciate a better sleep. Not sure which would be the best for him, Thank You for this offer. I sleep with a fan on me year round! I’d love to win one of these! Thanks for the chance! i would love this bed, i have a lot of aches and pain and this bed will solved my problems,also it will keep me cool also,I would really need this bed. I really love the SLEEP EZ ROMA. I love the fact that it is a cooling mattress. I am always in awe when it comes to BB Mattresses! They’re so uniquely made and designed. Such a great opportunity. Thank you Sleepopolis! I would love a comfy new mattress. This one sounds like it could be my favorite. The Zenhaven is my favorite latex mattress. We’re both side sleepers, so that one would be great. BUT, I’d consider a hybrid too. Sooooo many good mattresses! I too would love the mattress. Looks amazing! Zenhaven is my favorite latex mattress for the cooling factor. Would love to read my head on that mattress! I would love to win a cooling mattress. I would love a new mattress because my allergies are terrible. I’ve had the same mattress for decades but mattresses are expensive! The Brooklyn Bedding Aurora looks AMAZING! As a hot sleeper, it would be such a wonderful fit. I’d love to win. The Zenhaven looks like a WINNER to me as I’m a side sleeper 100% of the time and also a hot sleeper. I’d love the Brooklyn Bedding Aurora mattress! I need something that will keep me cool while I sleep. The Novosbed Mattress is my favorite because I love foam mattresses and it seem to have just the right amount of firmness for me. Latex for Less mattress is my favorite latex mattress so far. Out of all of the reviews my favorite is still the Brooklyn Aurora bed! I like that it’s best for couples,soft and has the cooling technology. I need a mattress like this! Mine is old & uncomfortable. I am day dreaming of winning and owning this mattress!! I really need this in my life!! Thank you for this opportunity! I would love to win this. My husband has been complaining that his back hurts in the morning. 🙏 Thank you for the chance! Would love to win this mattress for me and my partner! My back has been killing me when I wake up, so I know it’s time for a new mattress and this one seems like the right fit! I like the Zenhaven, but you have so many great mattresses to choose from. You have a wide range to offer for everyone. Zenhaven looks like a great latex mattress and Brooklyn Aurora a great hybrid! Brooklyn Bedding because this mattress is cool to touch. The Zenhaven is my pick! Anytime I read “cooling” in the description, I know my son would love the mattress. Thanks for the opportunity to win it for him. The Zenhaven is probably the best for me. Brooklyn Bedding Aurora mattress looks amazing. I could so use a new mattress like this one! Wow. The Brooklyn Bedding Mattress has foam top layers and coil base! I’m torn between several right now..loving the Ghostbed Luxe, Loom and Leaf, and this Brooklynn. So HARD to choose just one!! Cool to the touch sounds great with this mattress, the Brooklyn Aurora Mattress. Definitely would make for a great nights sleep, comfortably especially with the heat in Florida. I don’t know which is my favorite! I’ve never slept on a latex mattress! But would love to try! I love the Purple Mattress! Would love to win this bed!! My husband and I haven’t had a bed in a good while due to losing everything in our last apartment to bed bugs. This would be a blessing to us. Looks like a good mattress! I would love the Allswell Luxe Hybrid as I am a stomach sleeper and suffer with spinal fusion and degenerative disc disease of the spine also. Thanks for this amazing chance. Entered and shared. With love from Pennsylvania! I’d love to win this mattress for my mother, who needs a new one badly! I have 2 mattresses brom Brooklyn Bedding. The original #bestmattressever and the Arctic Dream. They are a wonderful company producing quality, comfortable beds in a box at a good price. This new Aurora Hybrid would be a nice addition. I would use it myself and move the #bestmattressever to the guest room. My guests may never leave!! ZenHaven sounds like the best fit for me. Would love to win this bed! I would LOVE to win this mattress! Would absolutely LOVE to win a Sleepopolis mattress, from everything that I have read about your mattresses they are amazing and would give both my husband and I a great nights sleep. Sometimes I have hot flashes when I’m sleeping. Sounds like this cooling bed might help. The Idle hybrid and the Avocado green are very inviting for me. The Brooklyn Bedding mattress looks like the kind of quality I need to rest on. 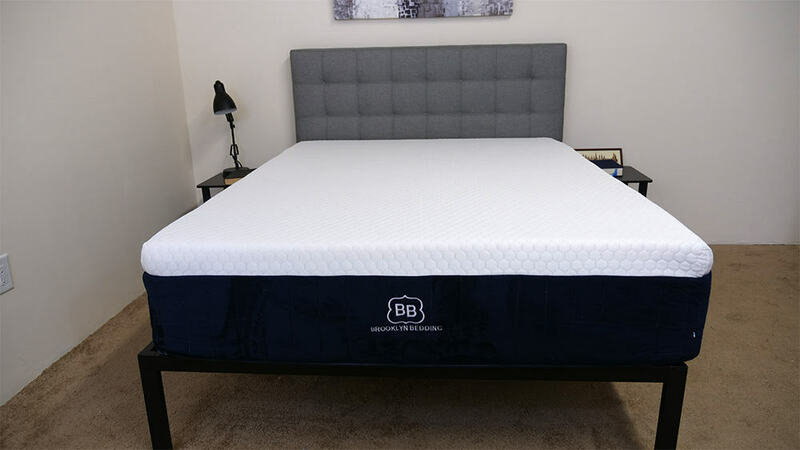 The Brooklyn Bedding Mattress looks the best to me because the hybred technology enables me to have a foam style bed, but with good edge support. My daughter needs this…she fights her covers all night! I like the Purple, but Brooklyn Bedding sounds great too! I’m a side sleeper so the Layla sounds really nice, but I think the Purple mattress would be great also. Would love to try out the Aurora (or the Freya, also by BB). Oh my, another one that would be perfect for me as a hot side sleeper! I’m very interested in the hybrid designs since I’m used to a traditional mattress. Love the cooling feature of the Aurora. I’ve got a few favorite but I’d try the Ghost bed. My favorite is the Zenhaven. Would love a new mattress!!! We really need a new twin mattress and it would be great to try this one! I’ve so many great things about this mattress company and I would love to win! Thanks for the giveaways and the reviews. I think the Brooklyn and Winkbeds are my favorites. The Brooklyn Bedding Aurora mattress is a hybrid bed that mixes gentle foam top layers with a supportive pocketed coil base for a truly all-encompassing sleep. What sets this baby apart is its phase change material cover, which makes the bed literally cool to the touch. Which means if you sleep hot, this is the bed for you! It would be a great night’s sleep! i really would love a bed. im sleeping on my ex husbands old hospital bed he left where i live. This one because of cooling factors. Avacado brand fir ecological reasons. I sweat a lot at night so a cooling mattress is definitely what I need. Thank you for sponsoring these sweeps and giving me a chance to win. Would love to sleep on this. The Nest Hybrid is my favorite latex mattress that was reviewed. New mattress is totally not in the budget, but boy, do we need one! This would be such a blessing! Thanks for the chance! Would love to win one of these Great mattresses! I am most enamoured with the Zenhaven and the Spindle. 👍 thanks for all the awesome chances! Hope I win! The Purple is probably my favorite. Have wanted this mattress since it first came out ! Thanks for the chance!